Body metabolic processes are complex and including too much protein while excluding the other essential macro and micro nutrients in bodybuilding diet will not ensure muscle growth. 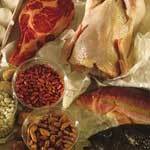 Sometimes extreme high protein diet plans can do more harm than good. Including a variety of foods that can burn fat, supply anti-oxidants and provide calories for energy should be a part of diet for healthy muscle growth. An ideal protein diet for body building is a balanced diet that consists of appropriate amounts of protein, carbohydrates, vitamins and minerals. 1. Algae- Spirulina is an excellent source of fiber, B vitamins and complete plant protein (shown to be absorbed more effectively than animal proteins). 2. Pine bark – Several studies have shown that pine bark boosts nitric oxide (increases blood flow and oxygen supply to the muscles) production in the body. 3. Kiwi fruit – Vitamin C is a pre-cursor for nitric oxide production. It also aids in cellular repair and muscle building. 4. Figs – Loaded with fiber, dried fruit can help decrease fat levels in the body. 5. Coffee berry – This is truly a super food and should be included in any bodybuilding diet as it promotes active recovery after intense exercise. 6. Krill oil – Many studies are now showing that krill oil may actually be better than fish oils. It is loaded with antioxidants and metabolism boosting chemicals. 7. Chili peppers – Burn fat and increase your nitric oxide levels naturally by adding chili peppers to your high protein recipes. 8. Long jack – Several studies confirmed this herb’s testosterone boosting ability naturally in a healthy way. For body building testosterone is an important hormone. 9. Spinach – Filled with circulation boosting nitrates and anti-oxidants that protect the muscle tissue from damage. Also contains magnesium that helps maintain muscle growth and definition. 10. Tribulus Terrestris – This exotic herb is known to boost athletic performance and increase muscle mass. Supplement your bodybuilding diet with the above mentioned foods for proper muscle building and functioning. High protein snacks are also available these days that claim to aid in muscle building. Consider buying organic bars with fewer ingredients to avoid toxic additives that can cause harm.